For Dallas-based artist Otis Jones, paintings are a bit like rocks. “My things aren’t rocks,” he muses “but somehow I’m trying to make something that’s like a rock.” It’s late summer and we’re sitting at a table inside his spacious, minimally furnished and tchotchke-free loft at South Side Lamar where he has lived and worked for 17 years. Sunlight floods through a wall of industrial-sized windows. Jones, 72, who was born and raised in Galveston, Texas, is feeling a lot of pressure right now. Eyes smiling through black, round rimmed glasses, he speaks with a measured Southern cadence. “Things are popping for me and I don’t know why, but they are and I’m so happy about it.” Multiple art fairs (Art Basel Miami, EXPO Chicago, Art Düsseldorf) and three solo shows (Marc Straus Gallery, NYC; Sunday-S Gallery in Copenhagen; Sorry, We’re Closed in Brussels) is a list of upcoming commitments that would make any artist’s head spin. Struck by the Zen atmosphere and his palpable calm, I ask him how he maintains such a state. Jones picks up a black stone off the table and holds it in his hand.He tells me he counts his breaths at night when he lies down. “I get real calm and I realize that I can only do what I can do, and if I do anything else it won’t be my honest work. I need to be true to how I make the painting.” His meditation practice came by way of severe lung illness. Six years ago, Jones underwent bilateral lung transplant surgery and had many near-death encounters leading up to it. “I would feel like I was drowning and I could not get out of it,” he explains. Panic, the body’s natural stress response, would set in which deepened the sense of suffocation. . He says, “I started to try to control my panic by counting my breath, taking a breath and believing there was another breath to be taken.” Jones’ hefty exhibition schedule certainly warrants bringing in assistants to help him meet his obligations, but the artist develops his work through such an intimate and personal practice that he finds the notion of someone else making his work for him inconceivable. Jones tells me he sets out to make something that embodies an essential feeling. His process begins with a shape that has been rolling around in his head. “It’s more of a notion or an urge or a desire or a certain kind of weight and physicality and it’s just that: a vague notion that’s always occurring.” Then he makes a drawing of its actual size and shape on a large piece of butcher paper and gives it to his carpenter, the only carpenter that he has found who will do things clumsily for him. “I want it to look like some guy who didn’t have a clue what he was doing carpentry wise made it in his backyard.” Examples of his “geometry” are dispersed throughout the studio: an off-kilter ellipse, a warped circle, a top-heavy oval, a couple variants of vertical rectangles with rounded corners. 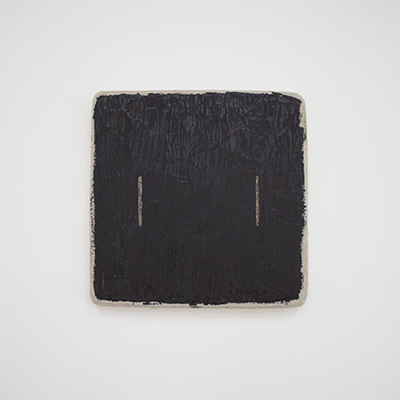 For Jones, painting is a kind of geology in that he places importance in revealing each step of the making. 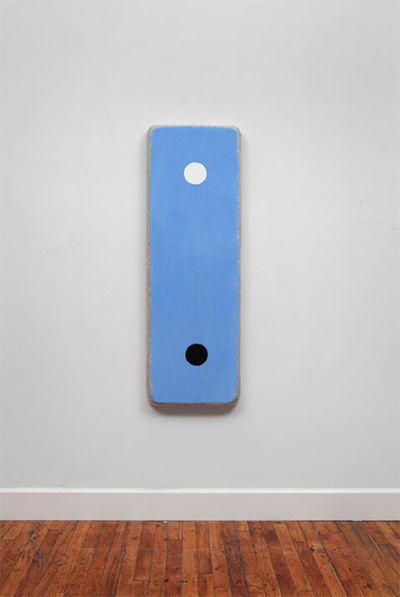 On the wall are two large canvases, an “ellipse” and a “circle,” on which the artist is working simultaneously. They’re both supported by stacked plywood edges that are covered in amber stalagmites, the result of dousing the panels with glue and pushing the linen onto the surfaces with a blade. Staples applied with an air gun meander the parameters, attaching the linen. 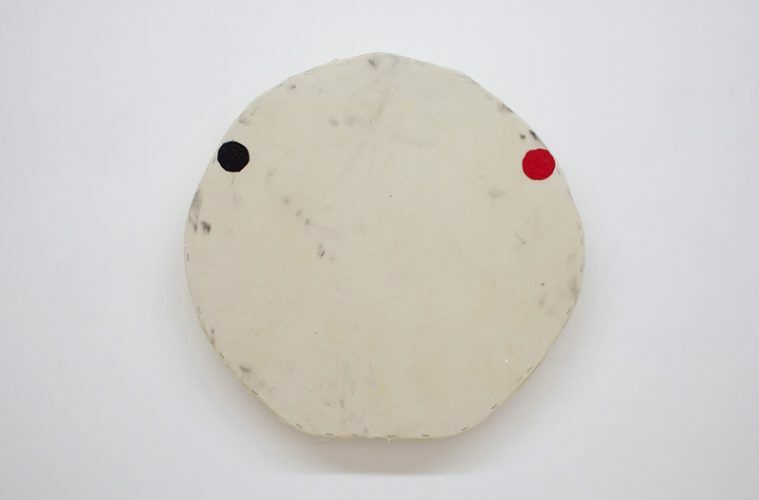 The circular canvas, guided by the artist’s notions and urges, has received three layers of dense, turbid acrylic: red oxide, then black, then red oxide again, half of which has been sanded down. The current surface is speckled with evidence of each pre-existing layer. Jones is pleased with the sanded portion, especially how parts of the black layer show through.